Sweet potato (Ipomoea batatas) is a sweet root vegetable native to Central and South America. It has yellow or orange flesh, the skin may either be white, yellow, orange, red or purple. As opposed to the general belief, sweet potato is only distantly related to the common potato (Solanum tuberosum), belonging to a different botanical family. Sweet potato is an excellent source of vitamin A and a very good source of Vitamins B6 and C; excellent source of carbohydrates and fiber. The sweet potato (Ipomoea batatas) is a dicotyledonous plant that belongs to the family Convolvulaceae. Its large, starchy, sweet tasting tuberous roots are an important root vegetable .This plant is a herbaceous perennial vine, bearing alternate heart-shaped or palmately lobed leaves and medium-sized sympetalous flowers. Colors: yellow, orange, and purple. Choosing: Choose sweet potatoes that are firm and do not have any cracks, bruises or soft spots. Avoid those that are displayed in the refrigerated section of the produce department since cold temperature negatively alters their taste. Buying: can be found in local supermarkets. Procuring: The plant does not tolerate frost. It grows best at an average temperature of 24 °C (75 °F), abundant sunshine and warm nights. Annual rainfalls of 750–1000 mm are considered most suitable, with a minimum of 500 mm in the growing season. The crop is sensitive to drought at the tuber initiation stage 50–60 days after planting and is not tolerant to water-logging, as it may cause tuber rots and reduce growth of storage roots if aeration is poor (Ahn, 1993). Under optimal conditions of 85 to 90% relative humidity at 13 to 16 °C (55 to 61 °F), sweet potatoes can keep for six months. Colder temperatures injure the roots. They grow well in many farming conditions and have few natural enemies; pesticides are rarely needed. Sweet potatoes are grown on a variety of soils, but well-drained light and medium textured soils with a pH range of 4.5-7.0 are more favourable for the plant (Woolfe, 1992; Ahn, 1993). They can be grown in poor soils with little fertilizer. However, sweet potatoes are very sensitive to aluminium toxicity and will die about 6 weeks after planting if lime is not applied at planting in this type of soil (Woolfe, 1992). Because they are sown by vine cuttings rather than seeds, sweet potatoes are relatively easy to plant. Because the rapidly growing vines shade out weeds, little weeding is needed, and farmers can devote time to other crops. In the tropics, the crop can be maintained in the ground and harvested as needed for market or home consumption. In temperate regions, sweet potatoes are most often grown on larger farms and are harvested before first frosts. China is the largest grower of sweet potatoes, providing about 80% of the world's supply; 130 million tons were produced in one year (in 1990; about half that of common potatoes). Historically, most of China's sweet potatoes were grown for human consumption, but now most (60%) are grown to feed pigs. The rest are grown for human food and for other products. Some are grown for export, mainly to Japan. China grows over 100 varieties of sweet potato. The roots are most frequently boiled, fried, or baked. They can also be processed to make starch and a partial flour substituteAlthough the leaves and shoots are also edible, the starchy tuberous roots are by far the most important product. In some tropical areas, they are a staple food-crop.Candied sweet potatoes are a side dish consisting mainly of sweet potatoes prepared with brown sugar, marshmallows, maple syrup, molasses, orange juice, marron glacé, or other sweet ingredients. Often served in America on Thanksgiving, this dish represents traditional American cooking and of that prepared with the indigenous peoples of the Americas when European American settlers first arrived. Sweet potato pie is also a traditional favourite dish in southern U.S. cuisine. Sweet potatoes slices are fried in bacon drippings and eaten with the bacon on toast. This is a traditional autumn breakfast food in rural Kentucky. Baked sweet potatoes are sometimes offered in restaurants as an alternative to baked potatoes. They are often topped with brown sugar and butter. In Dominican Republic, sweet potato is enjoyed for breakfast. In China, sweet potatoes are often baked in a large iron drum and sold as street food during winter. Sweet potato greens are a common side dish in Taiwanese cuisine, often boiled or sautéed and served with a garlic and soy sauce mixture, or simply salted before serving. They, as well as dishes featuring the sweet potato root, are commonly found at bento (POJ: piān-tong) restaurants, . The young leaves and vine tips of sweet potato leaves are widely consumed as a vegetable in West African countries (Guinea, Sierra Leone and Liberia, for example), as well as in northeastern Uganda, East Africa (Abidin, 2004). According to FAO leaflet No. 13 - 1990, sweet potato leaves and shoots are a good source of vitamins A, C, and B2 (Riboflavin), and according to research done by A. Khachatryan, are an excellent source of lutein. Steamed/boiled chunks are boiled in water or cooked by microwave. A Japanese yaki-imo vendor and cart outside Nara Park.Sweet potato butter can be cooked into a gourmet spread. History: Sweet potatoes are native to Central America and are one of the oldest vegetables known to man. 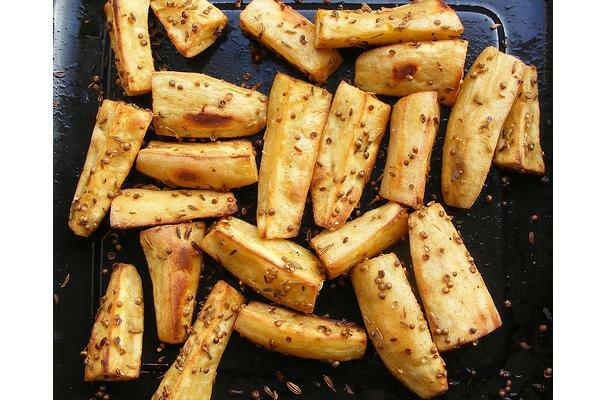 They have been consumed since prehistoric times as evidenced by sweet potato relics dating back 10,000 years that have been discovered in Peruvian caves. TV-MA: designed for adults and may be unsuitable for kids under 17; contains one or more of the following: graphic violence (V), strong sexual activity (S), and/or crude language (L) V-chip (V is for "violence"). It all sounds so appealing — often, so much better than it really is. Batteries and battery fluid pose serious risks, including choking, internal bleeding, and chemical burns.